Tabbed and zoomer docks to go with the rest of the suite. Is objectdock different than objectbar? I really think this stuff looks good but not sure how to use it. Do I need to download another app as I already have OB installed on my system? Edit: Okay I figured out that I needed to DL object dock, which I did, but how do I install this theme. Sorry for dumb question but never had a reason to use OD before so a noob in how to get it to work. Great docks for a great suite! Thanks! @Jess McGuay - to install OD backgrounds just double click on the dockzip and it will install it for you. 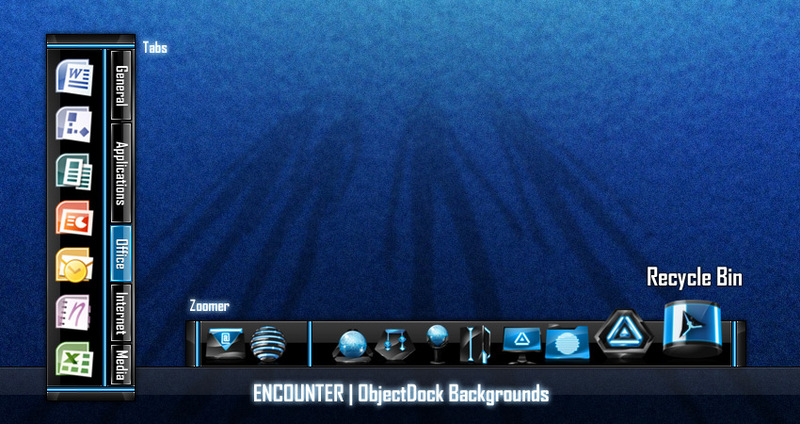 Then right click on the dock and select Dock Properties. From there you can change the background image. To change icons you must right click on the icon you wish to change and select Dock Entry Properties. From there you can browse to the new icon you want. Just remember that if the icon is in a zipped folder you will have to extract it first. hope this helps! You just need to copy the two folders to the "Backgrounds" folder in the ObjectDock installation folder. Then you can apply them in ObjectDock. Yes... It was never a dockzip from the beginning, someone else got that mixed up in the comments here - the zip just contains two background folders you need to extract yourself and copy to the Backgrounds folder in the ObjectDock installation folder - as stated above.